For most homeowners, the kitchen is the collective space for cooking, casual meals with the family, and celebrations of all kinds. 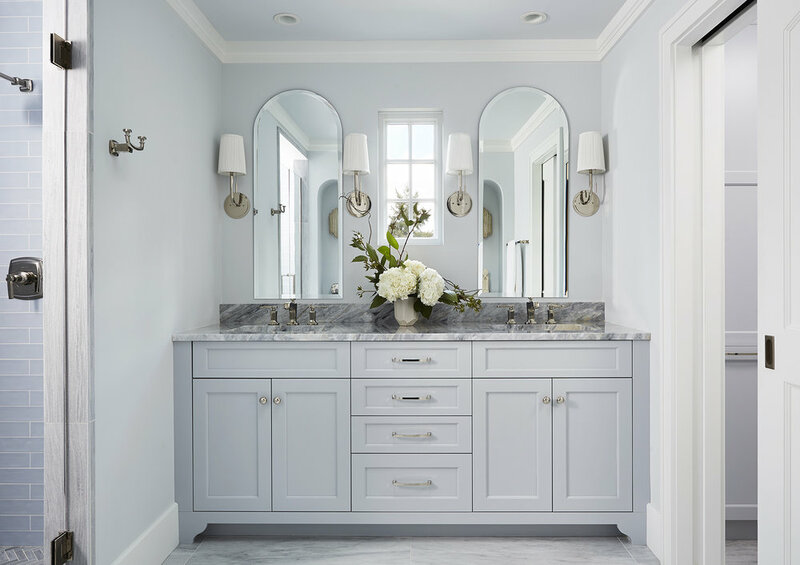 In this Edina Lake Cornelia neighborhood home, this large main floor renovation provided space to combine all the wants and needs on the homeowner’s wish list – a space for family and friends to gather. Before the renovation, the kitchen and family room area was closed off from the remainder of the home, and the dark wood colors added to the walled-off feeling. Beginning with opening up several smaller walkways, MA Peterson created an open-concept floor plan that brought in natural light from all corners of the home, and shed new light in other areas that were once gloomy. MA Peterson was able to find a unique approach to redefining the front entry with a notable wide-cased walkway that separates the entertainment spaces and the personal spaces of the home, as well as offering ample hidden storage behind the enameled custom paneled doors. With a refreshed wall structure and wall openings, the natural light of the skylights brightens the foyer, giving any guest a welcoming feel. Beyond the opening of the foyer wall, the dining room is a hidden banquet hall with a dry bar and entertaining storage. This large passageway offers a transition from the casual family room and kitchen to the formal living room and piano room, all while keeping similar tones and designs for continuous movement throughout the main level. 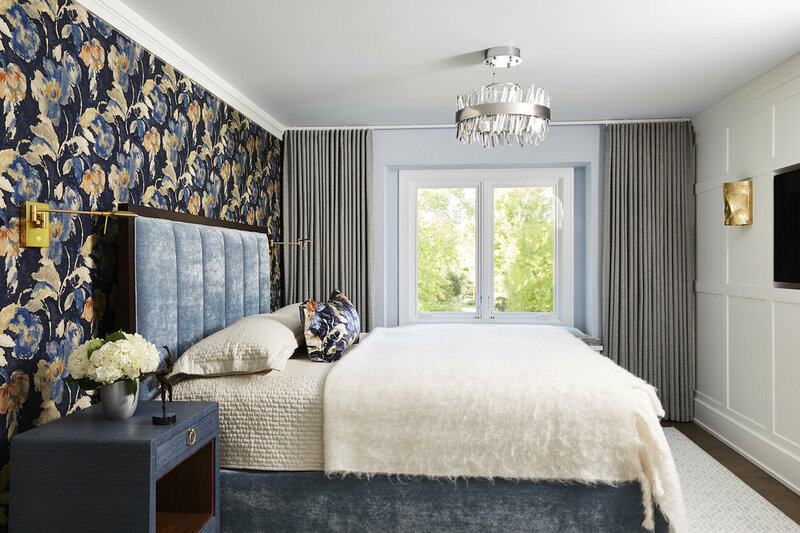 Throughout the main floor, the beauty and calming sensation of the rooms are created by the consistent hand-hewn walnut floors, soft blue walls, pure white mill work and warm pops of gold, which is consistent into the formal living room. The hexagonal-patterned wall, custom-designed and built by Trademark Wood Products, surrounding the cast stone fireplace is a unique eye-catcher, offering a reminder that even formal can be fun. The two wide doorways in the formal living room offer a view to the casual side of the home, where the kitchen and family rooms are located and both offer spectacular pieces that are unique to this home. Entering the kitchen, you are drawn to the kitchen island – a 15 foot long Wareham Quartzite waterfallsided island that is perfect for chatting with the cook or a place to do homework. The white-enameled cabinetry stretches into the kitchen, combining the continuous feel throughout the main level and complimenting the dark walnut floors. 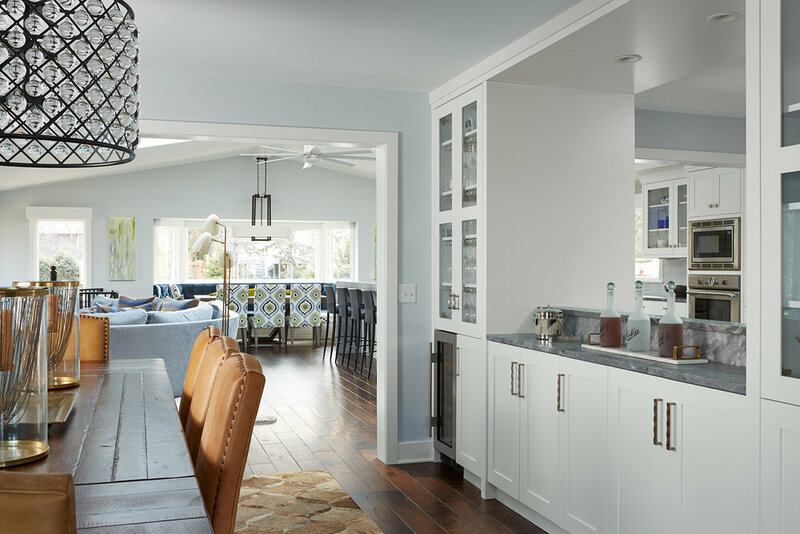 Sub-Zero, Thermador and Miele appliances add to the modern design while meeting the needs of this busy Edina family. The kitchen overlooks the casual dining space and the family room. The casual feel continues from the relaxed dining area to the family sitting and TV room. The dining space is complete with custom bay window seating and a pop of color that is consistent throughout the home. The family sitting room is the perfect place to kick your feet up for open conversation or to watch your favorite show, all while staying close to the space friends and family gather. MA Peterson prides itself in knowing that we’ve created something special for someone – the homeowner. If you’re curious what we can do for your family in your home, please feel free to reach out to us to discuss your wants and needs. Click on the links provided to view photos and read more about the kitchen remodel, the dining room, the formal living room or foyer. This spectacular home remodel was completed in collaboration with Lynn Peterson Design. Photography is credited to Susan Gilmore Photography.